The funny thing about the Panigale is that, despite my stream of superlatives and expletives every time I rode it, nobody else was that keen to jump on it at the start of a sweet road. And when it came to rain or trying to hold stable, crossed up wheelies, it wasn’t my first choice either. The Ducati is, without a doubt the most exciting bike to ride here, but you’ve got to be confident and competent for that to apply. Anything less than full belief in your riding skills will leave you with a deflated ego. Anything less than advanced-level riding ability will leave you with a bloody nose the first time you try to wrestle it. Of course, you could just stick it in 120hp ‘Wet’ mode and let everyone believe you’re a hero. It isn’t the winner here, probably because it scares people, but it’s the one bike I’m pining after the most. But then I love being scared. The Fireblade SP feels pretty ordinary in this company, but that might not be a bad thing. If you’re after a bike to live with every day, a bike to ride, a bike that will always do exactly what you ask without slapping you in the face with a ton of power, then the ‘blade is a good bet. 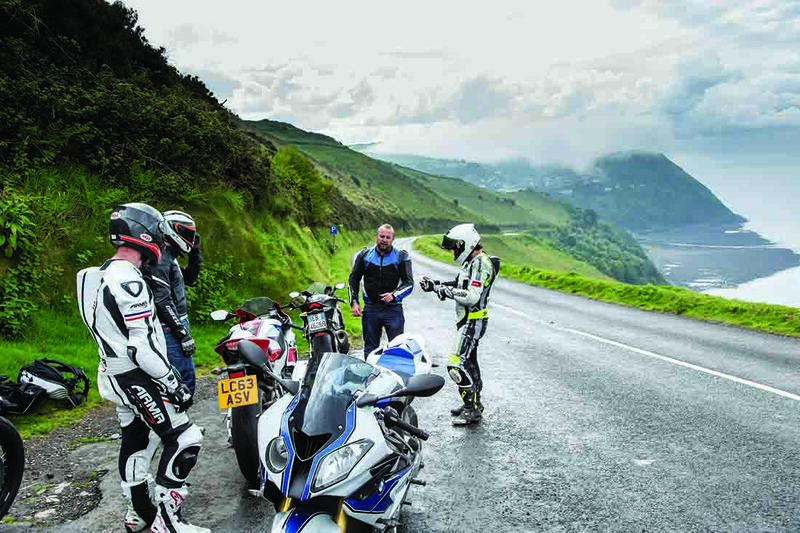 If all those things apply to you, chances are you already have a Fireblade. The SP version gives the everyman sports bike a little bling, a sniff more performance and makes it that bit more special, without doing anything to jeopardize its Fireblade-ness. The Honda press blurb says that it was born from the racetrack, what they mean is that there’s a single seat conversion and no pillion pegs. Neeeeoooowww. Just needed a local pub and we could have actually been on the Isle of Man. The BMW HP4 really is the most technologically advanced sports bike right now, but don’t mistake that for meaning it’s no fun. What the electronics do achieve is confidence for the rider. Confidence that it will all be fine, BMW is here to pick up the pieces if you get over excited. You can work away at a corner, pushing to the edge of your comfort zone, safe in the knowledge that if you overstep the mark or try and ask for 190bhp leant over on a white line, there’s a safety net. If going really, really fast is your thing, you won’t go faster on the road on anything else. 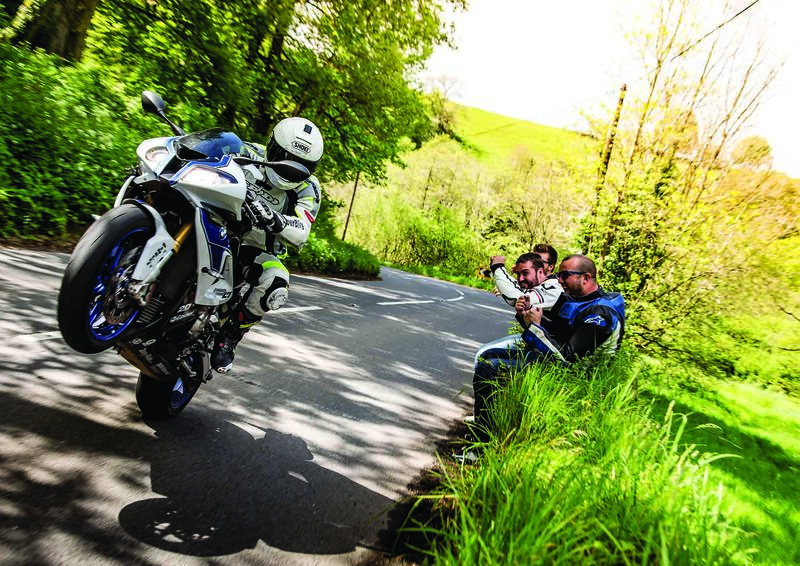 The HP4 is hugely powerful, it tips into a corner sweeter than anything but the Aprilia and works best on every road. From a technology and performance point of view, there’s nothing better. But we are human, thus susceptible to emotions and the Aprilia made us feel more special. 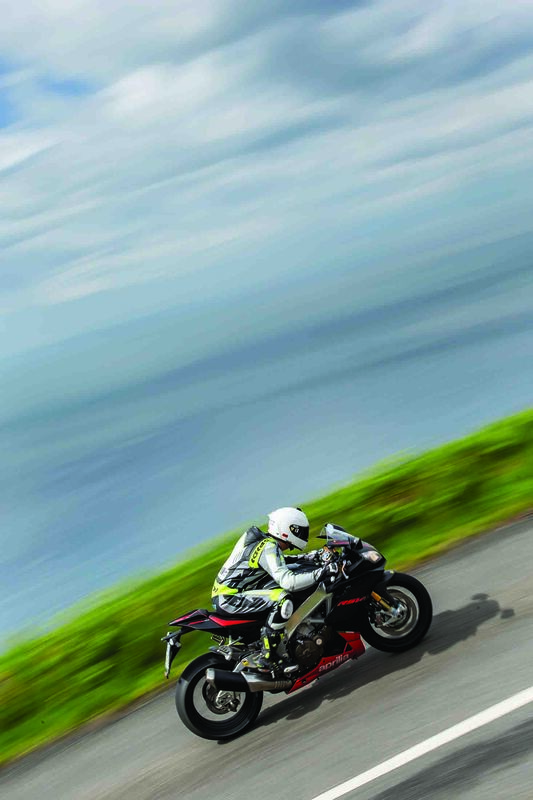 The RSV4 Factory – we bloody love it. The Aprilia RSV4 Factory has to be one of the most underrated bikes of the decade. No it’s not as fast as the Panny or HP sauce in a straight line, but come on, this isn’t a drag racing test. A great chassis will make every ride memorable from the first confidence-boosting apex to the final, lazy knee drag as you roll into your home town. A great engine makes you look for any excuse to hit the starter button, or stick in a needless downshift in a tunnel. A great electronics package doesn’t sit between you and the controls, it peers over your shoulder, tweaking and correcting only when necessary. When all three of these things come together in a harmonious, compact and beautiful package, they can make engineers drop their clipboards and wheelie off in search of more roads. The HP4 is a better bike, technically, but nothing could match the feel of the Aprilia to ride. Sometimes logic just isn’t enough, sorry BMW, this one belongs to the Aprilia RSV4 Factory. The Rock-Paper-Scissors for the keys starts again.